(Video) Blood Moon - Why Does It Happen? (Video) Blood Moon – Why Does It Happen? What do all these have in common? First they are all a bit rare. Second, they each require special circumstances to happen and last, they are all amazing to watch. I know this post is coming out after the actual event happened on the evening of Sept 27, but it is still so interesting that we thought a bit of the story as to why it happens was still needed. Unfortunately it will be 2033 before all the elements that made last week’s super moon, blood moon combination happen again. Even though that’s the case, the below article (and a video from Nasa at our Facebook page) does about as good a job as any I found in describing how this occurs. And if you want to colonize the moon, maybe you could look at the next one of these from a completely different perspective! A lunar eclipse occurs when the Earth is between the full moon and the sun. The Earth’s shadow covers the moon, which often has a red color, hence the “blood” moon nickname. Although it’s completely in the shadow of Earth, a bit of reddish sunlight still reaches the moon. “That red light shining onto the moon is sunlight that has skimmed and bent through Earth’s atmosphere: that is, from all the sunrises and sunsets that ring the world at any given moment,” according to Alan MacRobert of Sky and Telescope magazine. …… And what does a Supermoon mean? It just means the moon looks a bit bigger than usual since its a bit closer to the Earth than usual. “Because the orbit of the moon is not a perfect circle, the moon is sometimes closer to the Earth than at other times during its orbit,” NASA scientist Noah Petro said in a statement. ….. What is uncommon is for a total lunar eclipse to coincide with a Supermoon. There have been just five such events since 1900 (in 1910, 1928, 1946, 1964 and 1982), NASA said…. For the full article, please see USA Today. 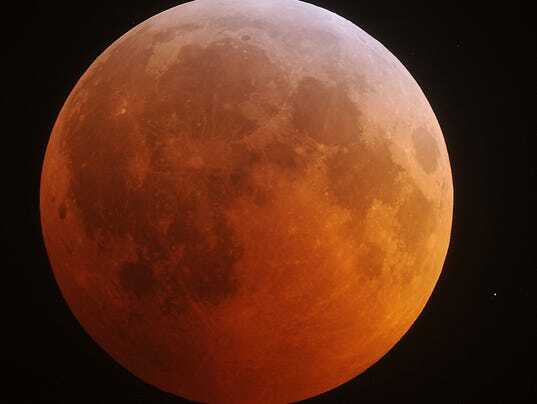 Be the first to comment on "(Video) Blood Moon – Why Does It Happen?" IS LIFE LURKING UNDERNEATH MARS’ SURFACE?